For Global Design Project 084 I decided to use some new product from the 2017=2018 Annual Catalog. We demonstrators were give the opportunity to pre-order the Eastern Palace Suite in April. It was certainly fun to play with and will continue to bring hours of enjoyment as each card is so different and there are countless different designs that can be created. I've discovered that my own creating and card making style likes to create something different for each card. I am not a huge fan of mass producing the same design over and over. I know some people love the concept of mass producing one design in a type of assembly line format. I guess this just goes to show we are all a little different. 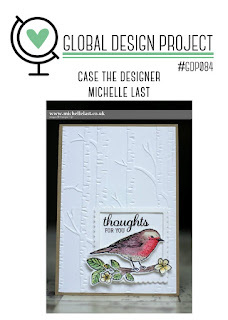 For #GDP084 we got to CASE the talented Michelle Last. I chose to CASE the sketch of her card and create something similar using the Eastern Palace Suite. 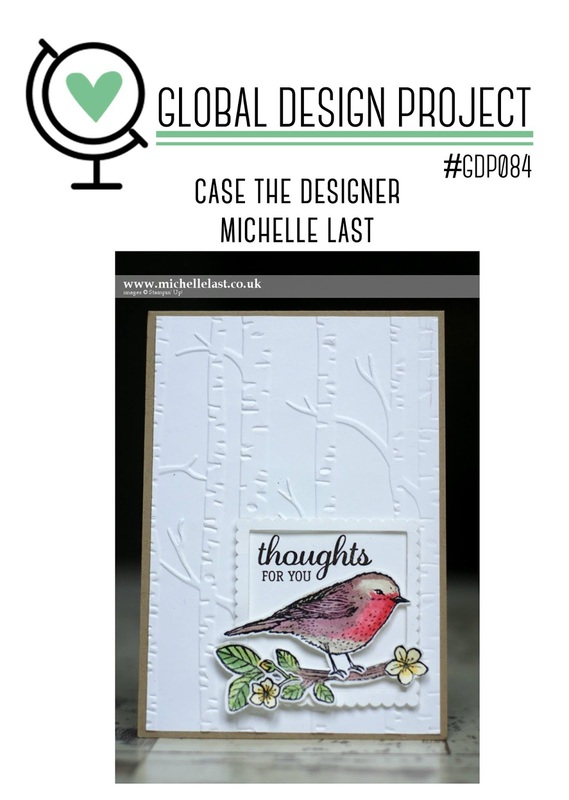 To see the design inspiration and the rest of the entries in #GDP084, visit Global Design Project 084. Today's video was the fourth and final card for the Sprinkles of Life online card class. Today we got to play more with the Tree Builder Punch and use the Silver Glimmer Paper. I love the sparkles Glimmer paper leaves all over the card front. Check out the video from today and get your first glimpse of my new desk while I'm creating this card. The videos in May will feature the Balloon Adventures stamp set, which is retiring. So, don't miss out on your chance to make some amazing birthday/celebration cards. Since I haven't gotten the sample cards made and online yet, I'm extending the deadline to RSVP until May 7. I will also be doing a couple of bonus cards with the Nailed It bundle. If you have that stamp set or plan to buy it before they're gone, let me know and I'll throw in a couple of bonus card kits for the Nailed It bundle cards. I didn't really mean to disappear from this blog last week. In fact, I found myself trying to figure out what was going on-what was wrong with me-why wasn't I creating. Well, I've discovered sometimes there are things in business that have to be done that don't involve creating. And, last week had some pretty time consuming life activities, so my time for Stampin' Up was limited. And, that limited time had to be taken up with non creative activities by necessity. But, I hope I get to be back to a more creative schedule this week. Today, I've been working on reorganizing my corner of the classroom with a new secretary style desk and other ways to organize my stamping supplies. I'll do a blog post with a whole tour once I get the last piece of furniture May 7. So, be watching this blog the week of May 8 for an inside look at my crafting area. You can get a small sneak peek by watching my video that I film this Thursday, April 27 or next Thursday, May 4. To purchase products needed to create this card, shop in my store here. All of the Designer Series Paper from both the 2016-2018 Annual Catalog and Occasions Catalog is retiring and is now only available as long as supplies last. Some, in fact, as already sold out. So, if there is anything you have been dreaming of owning, I would act fast. We have no way of knowing how soon things will sell out. I thought I'd share some photos of cards I have made using Designer Series Paper that is still available as of five minutes ago. If there are other retiring products used in the making of these cards, I will try to list those products in the photo captions.